When was the last time you checked out your Windows Live Mail account? Common, don’t be shy, I’m pretty sure you have one, like I do. Â Either your using Windows Live Mail as a primary webmail or just a dumping ground for your “graymails.” Either ways, you’d be excited to know that Microsoft is sort of re-engineering its webmail service to, well obviously battle it up against Yahoo! Mail and Gmail. In fact, while I was reading about the new features of Windows Live Mail one by one, I can’t help but notice that most of these features were either standard webmail features or copied from Gmail and Yahoo! Mail. So what are the changes that you should expect from the soon to be released new Windows Live Mail. To tell you frankly, quite a lot. First up is the perennial problem on inbox cluttering. The new Windows Live Mail will feature categorization whereby all your emails from social networking sites, emails from friends and contacts, shipping notices, appointments and more. 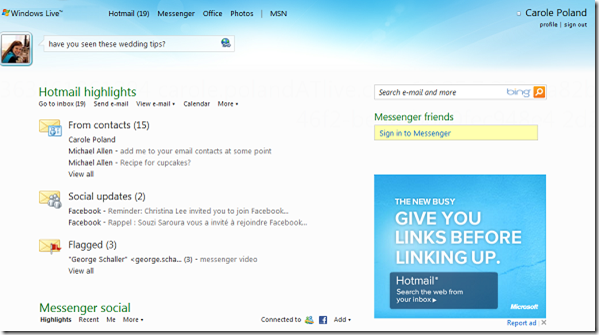 What’s good about this new feature is that it will give you a sneak peak of what’s new in your Windows Live Mail inbox. You could even post updates to your Facebook accounts or post comments, right on your Inbox preview page. As you go a step inwards to your inbox, you can easily browse through all the emails you’ve received by those categories. Next, while you’re in you inbox, you can also instantly filter your inbox to free it from spam mails. The new Windows Live Mail will have a “virtual broom” which you can use to sweep away spam mails. Aside from cleaning up the clutter in your inbox, the new Windows Live Mail Inbox will also let you preview attached photos, view documents via Office Web Apps interface, preview videos from YouTube or Hulu and many other useful features. The new Windows Live Mail will be rolled out starting next week. Are you excited about it? 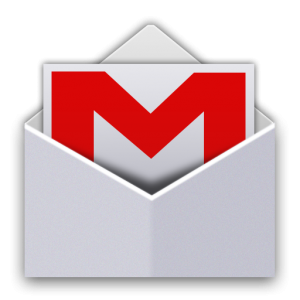 Will you be ditching Gmail once the new Windows Live Mail comes out? We all know that texting while driving is a big no-no. In fact some countries prohibit doing those two activities at the same time and may get you arrested if found guilty. But what if you’re on the road and you need to check a very important incoming message? Well, you can always pull over and check your phone. But that wouldn’t be unwise to do while you’re driving on the freeway. Thanks to Vlingo’s BlackBerry app checking your incoming text messages is now possibly while driving and won’t require you to use your hands. Vlingo just announced version 4.5 of its cool BlackBerry app with an added feature called “SafeReader.” Any guess on what this feature can do? Ok, SafeReader reads all your incoming messages aloud allowing you to digest your incoming email and text messages while you drive.Â The spoken messages are delivered audibly to ensure that you understand what the email and SMS messages are saying. In case you’re not using Vlingo on your BlackBerry app yet, now may be the right time to do so. Aside from this cool “SafeReader” feature, the app also features a powerful speech-to-text technology that lets you compose and send text or email messages, call a friend, search the web, update your Facebook status, use instant messaging, add contacts and calendar entries and other nifty features – just by speaking into your phone. The “SafeReader” feature expands this features by reversing speech-to-text to text-to-speech. Cool, right? To get the app, simply point your BlackBerry’s browser to www.blackberry.com/appworld or www.vlingo.com. Once installed on your BlackBerry device and before driving, simply press a button, speak to the device and say “Start SafeReader” and your incoming messages will be delivered audibly, without fail through spoken words. For whatever it’s worth Brightkite actually pioneered the location-based checked-in with social networking service a couple of years ago. Yes, long before Gowalla and Foursquare started to become popular Â it Â has been offering the same service. But for no apparent reason Brightkite became silent for quite some time now. Enter Brightkite’s latest offering called Group Text. Aiming solve the tedious process of organizing gigs and events among your friends through sending of numerous text messages addressed to several people, Brightkite is offering a better, faster and more cost-effective solution through Group Text. So, how does Group Text actually works? 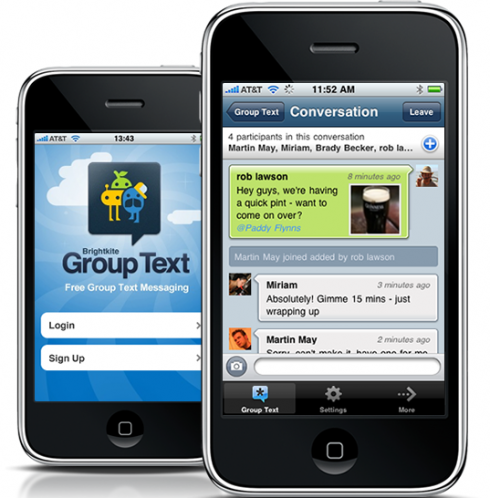 Â You create a group, enter your contacts and then send out a text to the group. The fun begins when your friends start receiving your messages via text, push notifications, mobile web or from the web itself. Â Then when anyone replies to your message, everyone in the conversation thread will receive the message as well. Basically, it’s like having email groups, only this time the main activity is done through text messaging. Brightkite Group Text allows you to create groups with up to 25 members. Once you’ve created a group, you can easily ping them, introduce new members or start any conversation with all the members of the group. The service is free, so that answers your question on possible mobile data service cost. Group Text also lets you send photos and locations to your group. You can also send messages directly from your desktop’s web browser. And finally, Brighkite has submitted an updated version of its iPhone app to Apple. Once approved the new Brightkite iPhone app will have the group text messaging feature.